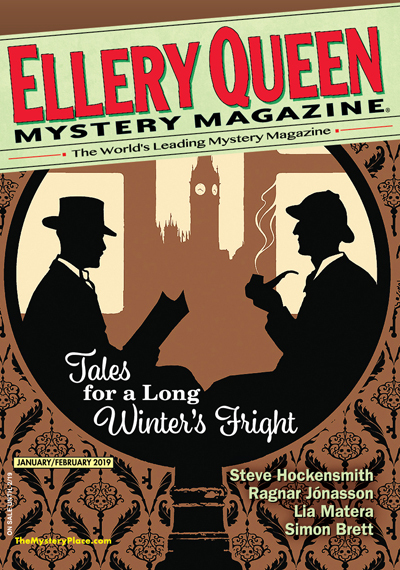 "My Christmas Story," by Steve Hockensmith, Ellery Queen's Mystery Magazine, January/February 2019. This is the third appearance here by my friend and fellow SleuthSayer Steve Hockensmith. I am rather surprised that it is the first one I have listed concerning his series characters the Amlingmeyer brothers. Old Red and Big Red are cowboys at the end of the nineteenth century. Old Red is illiterate but a huge fan of Sherlock Holmes. His younger brother Big Red is his long-suffering Watson. When this story opens Gus and Otto (to give them either more formal names) have just settled in Ogden, Utah, where they have opened a detective agency. Due to Big Red's big mouth they find themselves out in the hills searching for a pine tree to help their landlady celebrate Christmas. This being a crime story, other stuff happens. What makes these tales a treat is a combination of great characters and fine language. For example, our heroes meet three children and here is a bit of conversation with two of them. "We were out looking for a Christmas tree," the boy said, "and we spotted a bear and-"
"I spotted it," the girl -- Sariah -- interjected.
" --we think it might be dead, but if it's alive we thought we could shoot it and sell the meat in town--"
"I thought we could shoot it and sell the meat in town," Sariah said.
" --but we don't have a gun, so we sent our little brother to find somenoe who did--"
You can picture them, can't you? By the way, if you want to know what happens to the brothers next, you can find out in Hockensmith's new book The Double A Western Detective Agency. I can testify that it is, as Big Red, would say, a real ripsnorter.